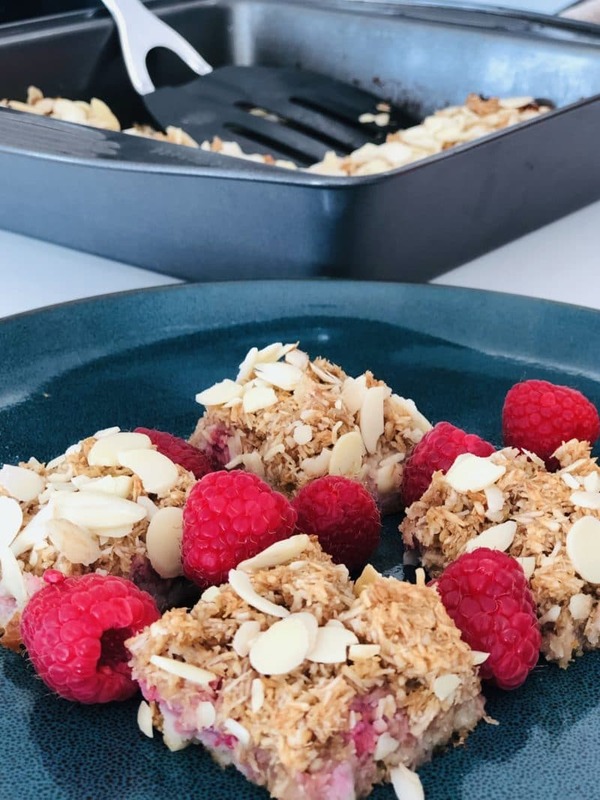 These Raspberry Bars are not only healthy but they are both dairy-free and egg-free and bursting with flavor! 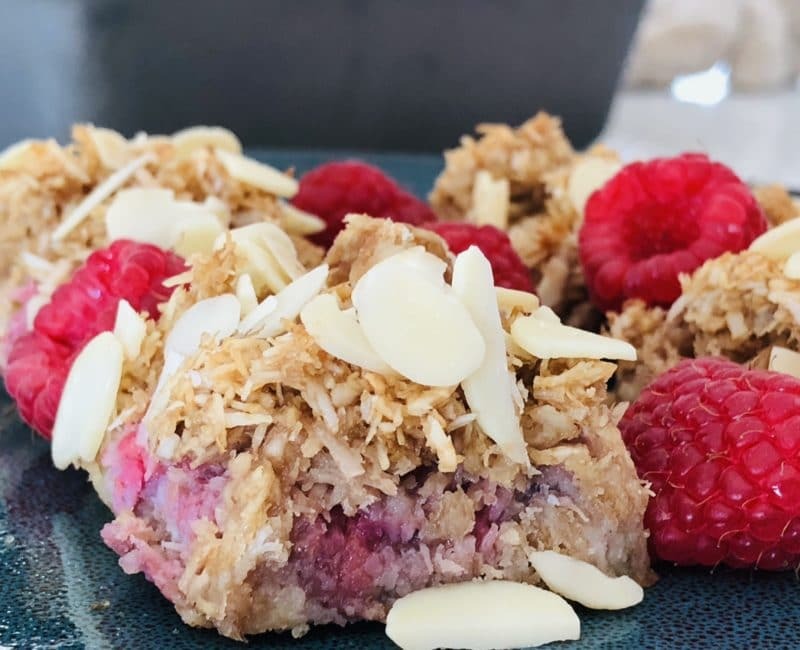 The soft, mashed raspberries provide a delightful flavor pop and contrast nicely to the crunchy top layer of baked coconut. The perfect dessert for Spring and Summer! Hi there, I wanted to introduce myself. I am Allison Leigh from Purely Ally and am a contributing writer at Recipes Worth Repeating. I happily live a plant-based lifestyle, and post my kitchen creations which are always free of meat, fish, dairy, and eggs. Many are naturally gluten free as well! I try to stay on the healthy side, but do sometimes post dessert recipes which use sugar. You will find that I stay away from most processed foods and choose maple syrup and coconut sugar where possible. I also write interesting posts about travel, lifestyle, restaurants, food products, health and the environment as they relate to the plant-based life. These bars are so much fun to make! Preparing the three layers is so quick and simple! First, you’re going to focus on making the crust and topping. 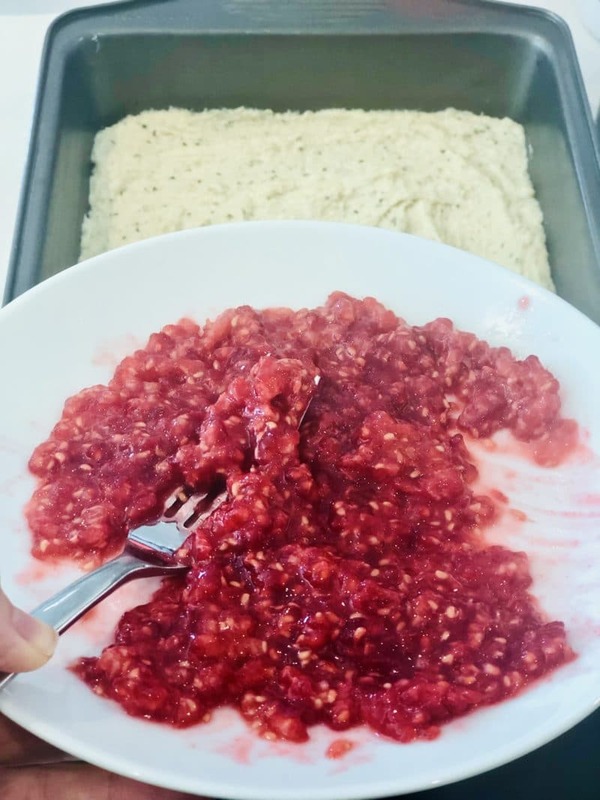 Once you mix the ingredients required for the bottom and top layers and mash your raspberries, you can start spreading! 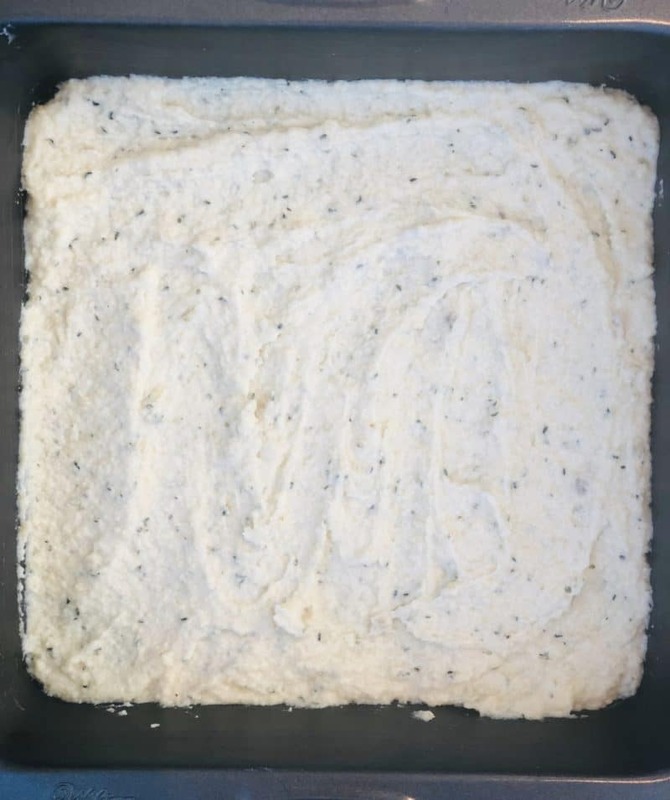 Use a 9″ (23 cm) square baking pan for this recipe. Make sure you grease your pan before you spread the first layer, otherwise the bars might not come out! I like to use the back of a spoon to spread each layer. Next comes the raspberry layer. Most traditional bars use raspberry jam as the filling. The raspberry jam is sweeter and thicker, so feel free to use that if you prefer…but I love using fresh raspberries. Those raspberries add a lot of flavor. 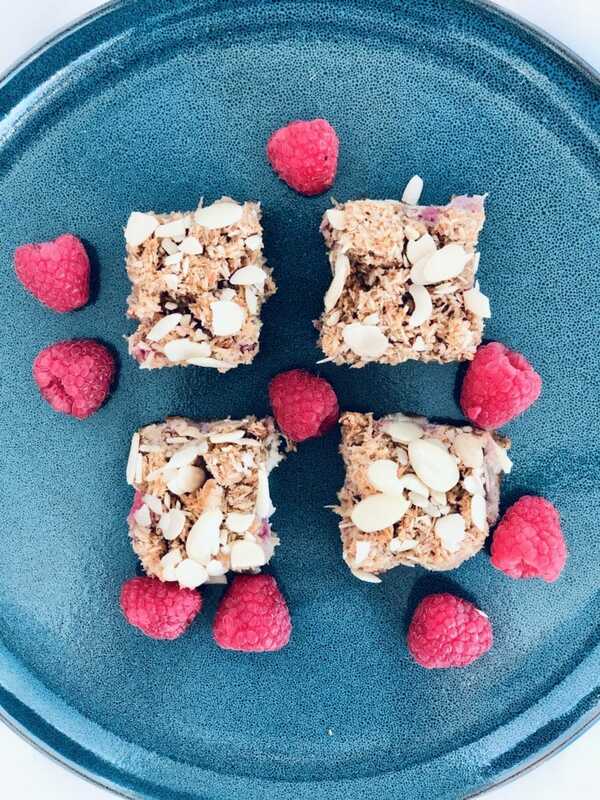 I love the taste of fresh raspberries all on their own and didn’t want to add more sugar to these bars. It only takes a second to mash them and spread them on top of the base layer. 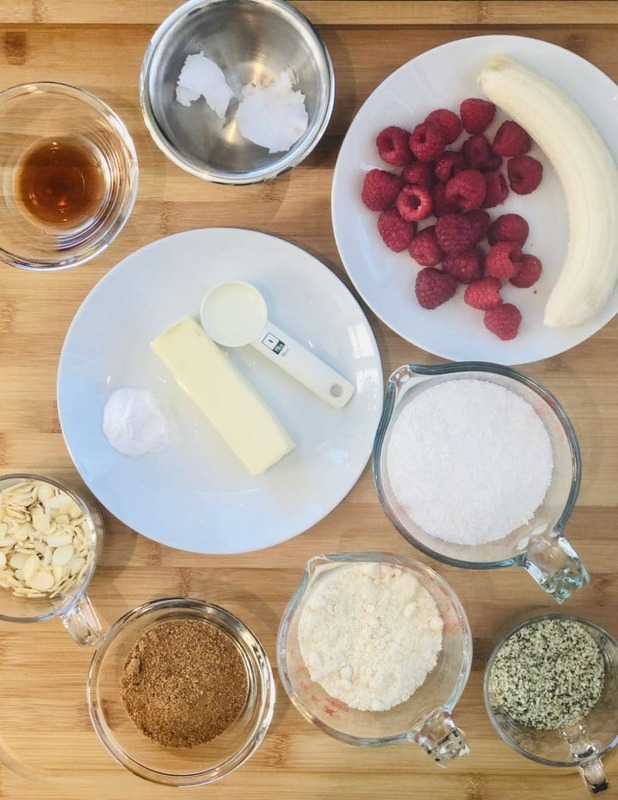 For the final layer, simply mix the mashed banana and sugar, then add the melted coconut oil, coconut, and vanilla. Stir it well until it is combined and spread it gently over the raspberry layer. Be careful not to push too hard as the raw layers underneath are more delicate than the top layer. Once the third layer is ready, bake the bars for approximately 30 minutes, or until the top layer has turned a nice golden brown. I wanted to add more crunch to these bars so I decided to sprinkle shaved almonds over top of the mixture halfway through baking. Almonds are so thin and can burn easily…so don’t add them too soon. Once they are done cooking, let the pan cool on the counter, then stick it in the fridge. The bars are much easier to cut when they are chilled. Don’t these look delicious??? Each bite is full of coconut and raspberry crunch! You can use whole wheat or white all-purpose flour in the base of these bars. If you use gluten free flour I would recommend using one which is a 1:1 substitute for all-purpose flour. Otherwise your results may not be optimal. I add hemp seeds to the base for added healthy benefits and nutrition, but that is up to you. Hemp seeds are a great source of protein as well as contain Omega 3 and Omega 6 fatty acids. After baking, let the pan cool on the counter. Once cooled, put the pan in the fridge before you cut the bars. They are much easier to cut and stay together better when they are cooler. 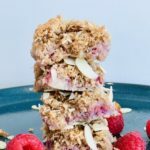 I love having one of these raspberry bars for breakfast! They go perfect with my coffee. They also make a really good snack or dessert. Looking for More Tasty, Healthier Plant-Based Recipes? 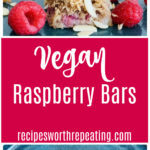 If you make these Vegan Raspberry Bar recipe, don’t forget to give it a star rating it and let me know how your batch turned out in the comments below! 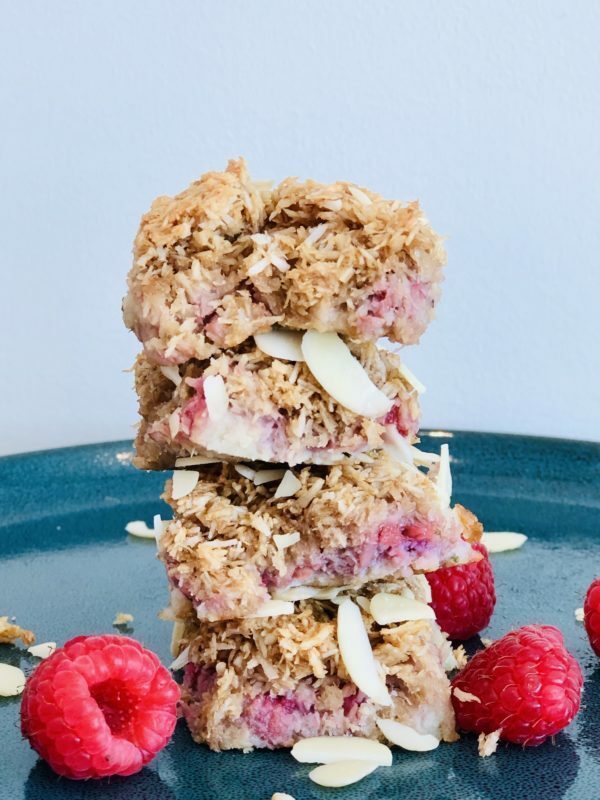 These Coconut Raspberry Bars are dairy-free and egg-free and are bursting with flavour! The soft, mashed raspberries provide a delightful contrast to the crunchy top layer of baked coconut. They are perfect for serving to company! 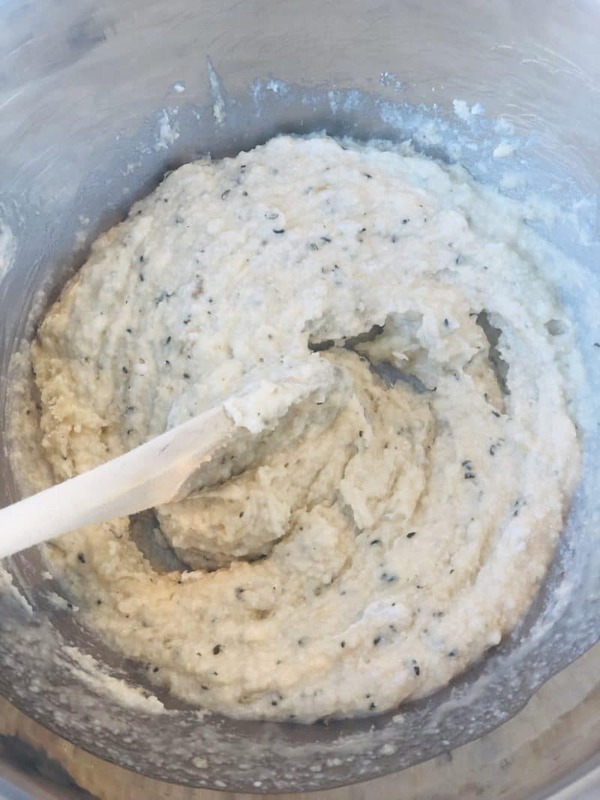 In a medium bowl add the flour, margarine, milk, baking powder, 1/2 mashed banana and hemp seeds (if using). Combine well. 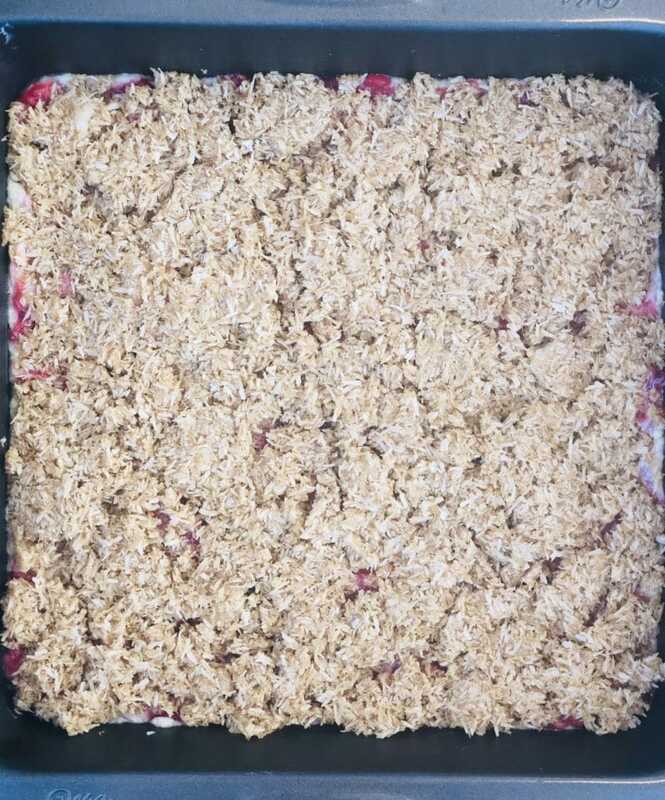 Add mixture to greased 9" (23 cm) square baking pan. Spread evenly with the back of a spoon. 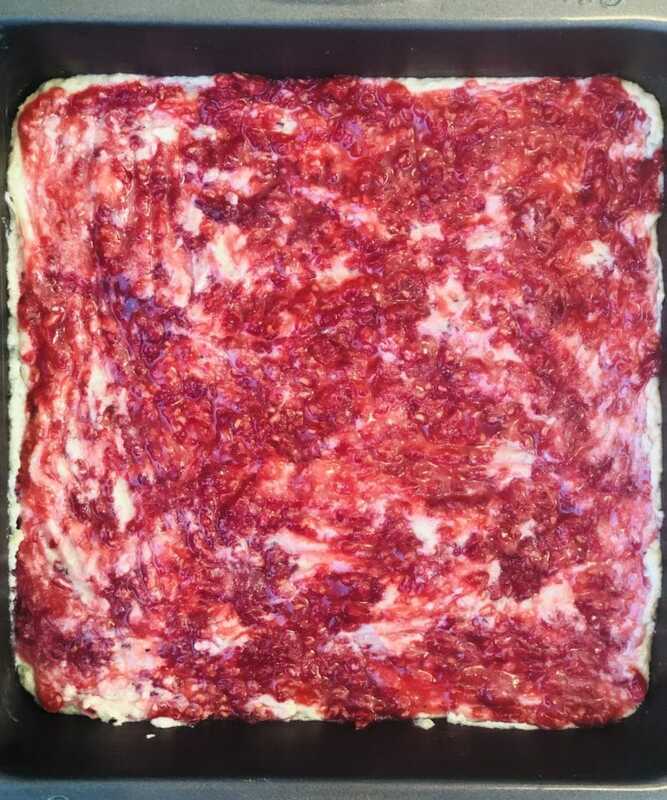 Spread the mashed raspberries evenly over the flour mixture in the pan with the back of a spoon. In another medium bowl, combine sugar and 1/2 mashed banana well with a fork. Stir in coconut, melted coconut oil and vanilla. Mix well until evenly blended. Gently spread coconut mixture on top of raspberry mixture in pan, being careful not to press too hard. Bake for approximately 30 minutes or until the top layer of the bars is golden brown. If using the almonds, remove pan halfway through baking and sprinkle almonds over the top layer of the bars. Return to oven to complete baking. Let pan cool on the counter, then place in the fridge for 30 minutes. The bars will be easier to cut when chilled. Ally is the author of Purely Ally, https://purelyally.com/, which is a food blog focusing on healthy, plant-based vegan eating. This looks stunning. You have explained it so beautifully and clearly that it sounds so easy.Surely trying this one soon. Thanks so much Aditi! I would love to hear how it goes if you try it! These bars looks fantastic. So fruity and delicious. Perfect for Spring and Summer. My kiddo love desserts like this one. I’m a big fan too. So I can’t wait to make this recipe for us. We will enjoy so much, I just know that. Thanks very much Natalie! Raspberries are our favourite fruit!